Connie Bergstein Dow - Welcome to Moving Is Learning! Leading a dance activity at my niece's sixth birthday party, April, 2019! "Skate along the Ice for I! For J we Jam and Jive. K's for Kicking as you swim, and float and splash and dive." Watch the alphabet come to life as children run and twirl and jump and play their way through the ABCs with energy! This imaginative alphabet book teaches young learners not only how to move from A to Z but also how to creatively have fun as they stay active and keep their bodies healthy and strong. The book includes a special section for parents and caregivers with tips for using movement to teach social-emotional skills. From A to Z with Energy! is a rhythmic ode to an action-packed day in a young child's life. It is filled with movement ideas which will inspire children to use their imaginations as they hop, gallop, twirl, and try lots of different activities and sports. The lilting verses and playful, colorful illustrations by Gareth Llewhelliin set the tone for a lively day of movement and fun. Why not use movement as a learning tool? Introduce simple activities into a child's day! Preschool creative dance class for WeTHRIVE! Hamilton County, Ohio, community wellness program. More info about From A to Z with Energy! Please visit me at Ohioana Book Festival on April 27, 2019, 10:30 a.m. to 5:00 p.m. Columbus Metropolitan Public Library (Main Branch), 96 S. Grant Avenue, Columbus, OH 43215. FREE and open to the public. No registration required. 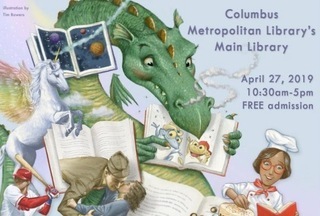 I will be doing a read, dance, and play activity at 2 p.m. in the Chldren's Room! From A to Z with Energy! is listed in SCBWI's Happy Book Birthdays, March, 2019!